Over 30 years ago, Masaaki Imai sat down to pen the groundbreaking book ‘Kaizen: The Key to Japan’s Competitive Success’ (McGraw Hill). Through this book, the term KAIZEN™ was introduced in the western world. Today KAIZEN™ is recognised worldwide as an important pillar of an organisation’s long-term competitive strategy. Since introducing this term as a systematic approach for business improvement, companies that implement KAIZEN™ have continually yielded superior results. 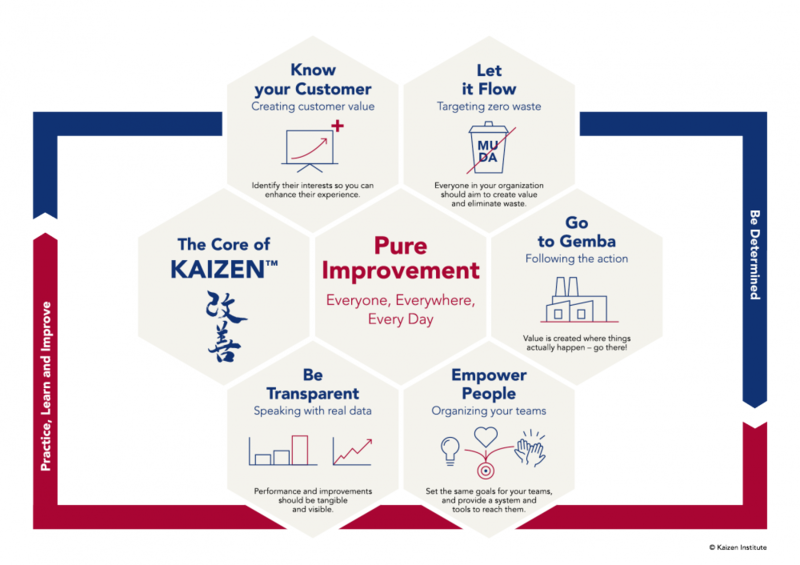 KAIZEN™ means "Change for the Better"
There are 5 Fundamental KAIZEN™ Principles that are embedded in every KAIZEN™ tool and in every KAIZEN™ behaviour. The 5 principles are: Know your Customer, Let it Flow, Go to Gemba, Empower People and Be Transparent. The implementation of those 5 principles in any organisation is fundamentally important for a successful Continuous Improvement culture and to mark a turning point in the progression of quality, productivity, and labour-management relations.